This is my fourth recipe for Nankhatai in this blog.Now that does say so much about my love for it,doesn't it.As I've mentioned many times before on this blog,I m always in search of Chocolate Cake recipes and Nankhatai recipes.Every time I try one recipe,I feel this is it,I've got the best recipe ever.But then,you know,bang comes another one. Sometime back,I compiled all my hand written recipe notes into word files and took a printout.Among them was a Nankhatai recipe which looked very familiar.It was written long ago,so I am not sure if it was from a blog or a tv show.The best part was when I discussed the recipe with amma,she said she used to follow a similar(almost same) recipe when she baked these.Now that is interesting.We decided to bake it together when I was home.To say we baked it more than 3 times in a week says a lot about the recipe. I think,I am resting my hunt here for the best possible Nankhatai recipe. Powder the sugar along with one cardamom and a few strands of saffron(if using) and keep aside. Sift(or stir) together maida and baking soda,keep aside. 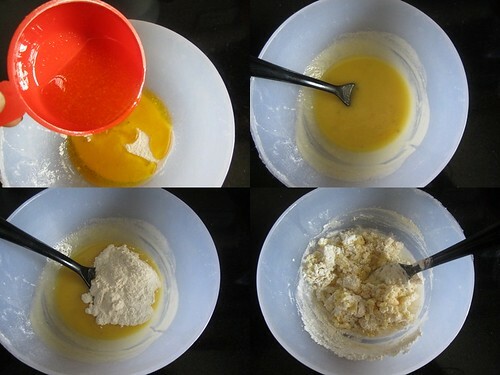 Mix together the melted ghee and powdered sugar to a smooth paste.Add the flour 1 tbsp at a time and mix together to form a dough.Knead the dough with your fingertips until it starts to come together. Rest the dough for about 1 hour and then pinch off balls of same size and then roll them smooth and place on an ungreased cookie tray. Bake at 170C for 20-22 minutes. You could add one or two cloves while powdering the sugar for an added twist. If you feel the dough is sticky,add 1 or 2 tbsp flour and then knead again.Do not be tempted to add more since that would turn out hard nankhatais,you wouldn't want that! Rest the dough for an hour or so and then bake the nankhatais.You could even keep the dough overnight which would improve the texture. 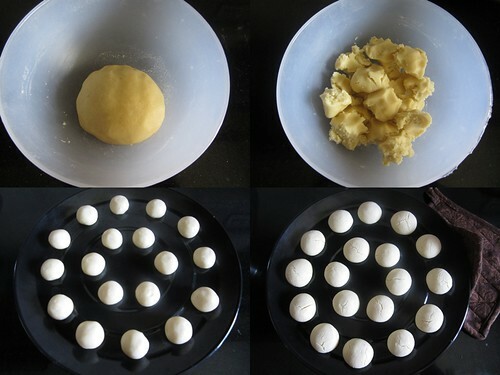 Baking time varies in each oven,so bake according to your oven.Be careful not to over bake and brown the nankhatais. Off these go to Srivalli's Cookie Mela. I love nankatiis too but as m kid are not too great fans of this I dont bake them. This is one that i would like to try though. They looks damn cute and addictive. I too tried this method once. it tastes the best.. Its a keeper..
Yum Divya!...I've never used ghee in biscuits...sounds yummy! 4 nanakhatai recipes..nice!! oh abt the tidbits I am really going bonkers..esp with the intro..had drafted the recipe 2 weeks back and had scheduled it for yesterday..thought of adding the yada yada but then i forgot and it got published ;) 3 houuse functions coming up within a week and I am already exhausted! :( blocked brains! These look so inviting! One of my favourites too! This is the version my aunt taught me too! Do you make the cashew macaroons? Simply tremendous looking nankhatis, luv this!! Nan khatai, Again? 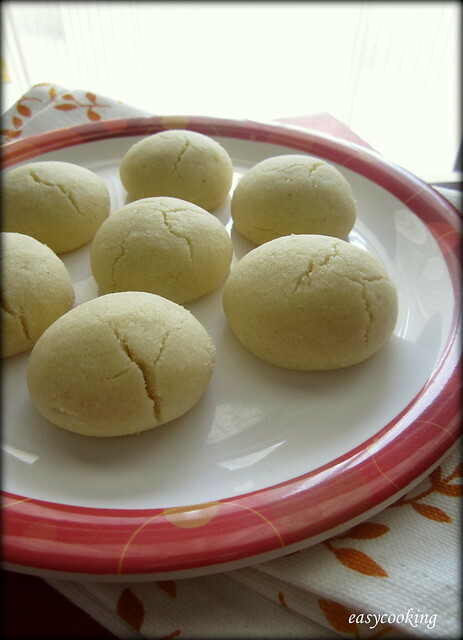 Recently i have come over here when i googled for nan khatais and urs made me drool!My mother makes the same but without baking soda...Looks so nice..Check out mine, i just posted it recently..You can also add ovaltine,boost etc for a different flavour u know.. Adding Boost is such a great idea,got to try once! You have a lovely space here. Following you now. Hi, I tried this recipe today.Came out very well. Thank you. Really the best?..well I seem to keep collecting them as well..I guess we can never decide on which one, though trust me I won't say no if you pass them to now..:)..Was quite a surprise seeing you baking so many cookies..thanks! Take my word,Valli-this one is indeed one of the best! can i use butter instead of ghee? Using butter(if melted and cooled)would work out well,go ahead. You can make it in Microwave convection of course,using the same temperature settings.However if it is a solo Microwave,bake it for 6-7 minutes in 80% power and rest for a while.The cookies wouldn't brown but will be cooked and crispy. I have microwave oven, so for how much time I need to preheat the oven at 170 C.
Hi Divya...I tried this recipe but they didnt come out as yours...i dnt understd what went wrng...nly instead of using ghee i used indian dalda...is dat the reason dat it came out flat...but it was lot tasty and crispy..
Dalda works well as a substitute,so that wouldn't be the issue.Was the baking soda fresh,did you overwork the dough or did you bake it for a longer period? Ever since my trip to India, I've been trying to find the perfect recipe for these cookies I bought in a shop. They were homemade and shaped like tall disks, white, crisp and almost chalky (but not in a bad way). The flavors were cardamom, coconut and lime; and I was told they were nankhatai but none of the recipes I've tried has duplicated what I ate. I'll try these. I tried these and they were tasting perfect!They were my best nankhatai till date!Thanks a lot!! Hey Anon,as I always say,each oven is different so baking time and temperature may vary.As you have mentioned,try reducing the temperature and bake for a li'l longer and see if it works.Eg,if you bake at 150C for 20 minutes,try baking at 120 or 130C for 22-25 minutes.Hope it helps-have a happy Diwali! I am a bit new to the baking scene...you haven't mentioned the necessity to preheat the oven here. How do I decide when it is needed? I am kind of new to the baking scene so I just had a doubt as to when I would need to preheat my oven? you have not mentioned it in this recipe. Hey Aish,preheat the oven for 5-7 minutes on 170C before you start baking the Nankhatais.Have a safe and Happy Diwali! 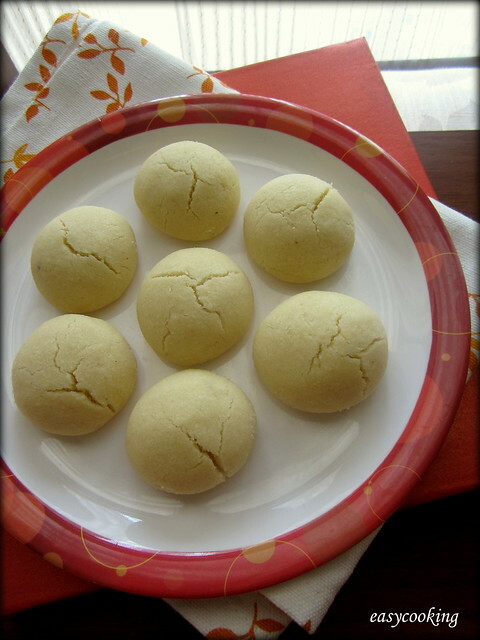 Just finished baking those nankhatais- they look simply yummy...will taste tomorrow for Divali- I have a cyclone convection oven so it actually only took only ten minutes to bake without pre-heating! That was quick and easy! I just tried your recipe and the nankhatai came out awesome.I was craving for these for a long time and this was just as perfect as store bought.Thank you so much for sharing.Love your clicks and tips.Looking forward to make other recipes that you have posted.Keep the good work going !! Prepared using the exact same recipe. It turn out good. Thanks. Can I bake cookies in the cooking tray which comes with the OTG?Mine is a Morphy Richards 28l OTG. Can i make it on a pan over the gas stove?? Can i bake it in a Non Stick Pan over a Gas Stove... will it work ?? I tried the recipe. 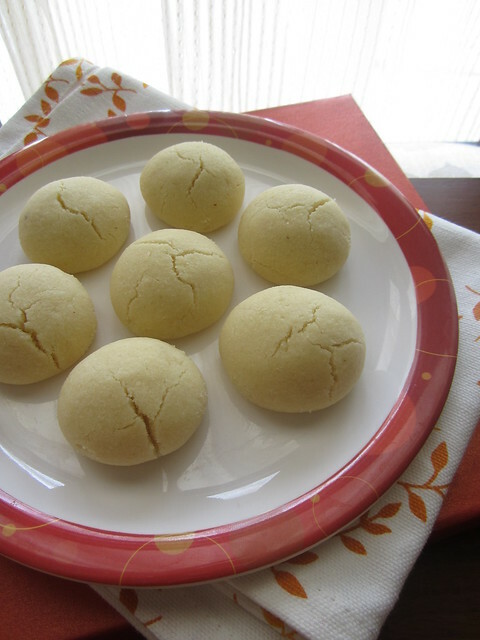 Everything was perfect just that the nan khatai came out very crisp and hard. Why did that happen? I followed each step but then also they were not soft as a nan khatai should be. I tried making nankhatais last weekend,it turned out very nice.I packed the box along to my relatives place n we all enjoyed these wonderful nankhatais.i not only won appreciation frm everyone but also gained confidence in making this recepie.Thank you so much. Thanks you very much for your recipe It turns out reaallllllly good and delicious. I just tried ur recipe...I think it has come out perfectly...have left it for cooling. Thanks so much for sharing this easy recipe. Am hoping my kids like it...I loved it as a kid.. Loved this recipe. Its perfect! Just the way I remember them from my childhood. Thanks a ton Divya! Hey i read the rave reviews of your recipe and tried it today but the dough was very sticky in fact it didnt come out like a ball after adding 2 tbsp flour as you mentioned. I am still to bake them but i think in the process of trying to make it doughy i have over mixed the dough. Really praying it comes out right...like the pic. Sorry for doubting your recipe .... they are indeed the real thing ....great going lady!!!! Indeed the best recipe... I make these all the time and specially for Christmas, I make a massive batch to share with others. Thank you so much for this no-fault recipe. Your recipe is perfect. I keep making these. It is super fast and I get perfect nankathais every time. Thank you.